Riverbend Fellowship in Borden, Saskatchewan (formally known as Borden Mennonite Brethren Church) was founded by Mennonite immigrants who arrived in Canada between the first two major Mennonite migrations from Russia. They settled in the Borden district in 1902–1903, hoping to benefit from the opportunity to obtain 160 acres as a homestead with the option of purchasing even more acreage. Their leader was David Klassen who had immigrated with them. The congregation began meeting in 1903 and organized officially in 1906. At first they used the school of Hoffnungsfeld as a meeting place. By 1907 they had completed the construction of their first church building which was used until 1952, when a new church sanctuary was constructed. One of the church’s first outreach programs was the support it gave to Herman Fast and his Russian ministry at Blaine Lake. Another outreach was the formation of a Sunday school among the Old Colony Mennonites in the Walter Scott school. Ministers who served the congregation prior to 1950 included David K. Klassen, Elder David Dyck (served 1906-1910), John A. Harder (served 1919-1935), Jacob J. Wiens (served 1912-1914 and 1934-1938), Jacob A. Nickel and A. K. Rempel. Paid ministers began to serve in 1965. The congregation was first known as Hoffnungsfeld Mennonite Brethren. The language of worship is English; the transition from German occurred in the 1950s. In 1955 the church celebrated its Golden Jubilee anniversary and in 1980 published a history book entitled Precious Memories: Borden Mennonite Brethren Church 1905–1980. In 2009 the congregation relocated from a rural setting (northwest of Section 15, Township 41, Range 8 west of 3rd Meridian) to the town of Borden, restructured, and changed its name to Riverbend Fellowship. The church chose to rent a hall in Borden instead of building a church. The church wanted to meet in the public square, in a place where people feel welcome. Mennonite Brethren Herald (27 May 1988): 68; (January/February 2017): 24. "Minutes of the 64th Annual Convention of the Saskatchewan Conference of Mennonite Brethren Churches: March 12 & 13, 2010." Saskatchewan Conference of Mennonite Brethren Churches." Web. 28 July 2011. http://sk.mbconf.ca/news/convention2011/2010-minutes.pdf. Toews, John A. A History of the Mennonite Brethren Church: Pilgrims and Pioneers. 1975: 155, 158. Available in full electronic text at: https://archive.org/details/AHistoryOfTheMennoniteBrethrenChurch. Unruh, Ewald and Orla Block. 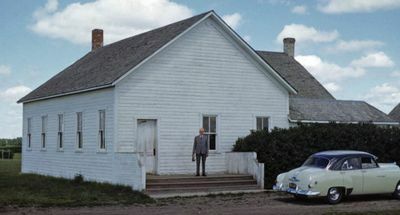 "Borden MB Church History (1905-1980)." Centre for Mennonite Brethren Studies. Congregational Records at Centre for Mennonite Brethren Studies. Epp, J. H. and Marlene Epp. "Riverbend Fellowship (Borden, Saskatchewan, Canada)." Global Anabaptist Mennonite Encyclopedia Online. July 2011. Web. 22 Apr 2019. http://gameo.org/index.php?title=Riverbend_Fellowship_(Borden,_Saskatchewan,_Canada)&oldid=163400. Epp, J. H. and Marlene Epp. (July 2011). Riverbend Fellowship (Borden, Saskatchewan, Canada). Global Anabaptist Mennonite Encyclopedia Online. Retrieved 22 April 2019, from http://gameo.org/index.php?title=Riverbend_Fellowship_(Borden,_Saskatchewan,_Canada)&oldid=163400. Adapted by permission of Herald Press, Harrisonburg, Virginia, from Mennonite Encyclopedia, Vol. 1, p. 389. All rights reserved. This page was last modified on 9 March 2019, at 01:46.